Hukamnama is by Sri Guru Amar Daas Ji in Soohee Raag on Ang 755 from Sri Guru Granth Sahib Ji. There is one eternal creative, nourishing, destroying being who is found through thesat, the true gurparsaad, through Guru's Grace. Guru Ji gives us this assurance do not saalaahi, praisedunee-aa, this world, this universe, why? because mar vanjsee, it will perish and pass away. Then Guru Ji says, do not praise lokaa, these people, jo mar khaak thee-ee, because they will mar, perish to khaakh thee-ee, thee-ee means to turn into dust -khaakh. Then Guru Ji says vaahu, he praises waheguru and saysvaahu, Hail, O hail to you mayray saahibaa, O my Lord, vaahu, O hail to you. Guru Ji says, the gurmukh,ones who follow the Guru sadaa - forever, they forever salaahee-ai,praise,sachaa - true vayparvaahu, Waheguru who is carefree, who is independent of all. Guru Ji saysrahaa-o, let us pause and think about this. Making a friendship with dostee with dunee-aa, with this world, with these objects around us. What does the friendship with the world means? The friendship with the world means attachment with the world, attachments to the things in the world, the cars, the money, the houses. manmukh dajh marann - Guru Ji says people who follow their minds get attached to this world. dajh marann, they die by burning. What does this mean? It means spiritually their soul, their mind burns with all these desires and that burning is never put out. And when they die, baDhay maaree-ah; baDhay, means to be bound and maaree-ah means to be beaten. They are beaten due to their own desires. vaylaa na lahann Thisvaylaa, this opportunity of human life, na lahann, does not come again and again. You have this opportunity, you have this diamond in your hand and you do not cast it away. But the Gurmukhs, their janam, life issakaarthhaa, is fruitful, is blessed, is amazing. sachai sabad lagann Because they lagann, they attach themselves to not to the world but the true Shabad, the true word, the true Naam. what happens when you attach to this true Shabad? aatam, within your soul, raam pargaasi-aa, you are illuminated. There is a light of who? Of ego? No; of desires? no; of Raam, of Waheguru, of that eternal God. sehjay sukh rahann And when that light of God burns within you, sehjay you go into the state of sehaj, of balance, of intuitive balance and you remain; rahann means to remain; you remain insukh - joy forever. Those people who have visaari-aa, have forgotten Shabad of the Guru, the Guru's words, doojai bhaa-ay rachann, rachann, engross themselves, surround themselves, in doojai bhaa-ay, in love of duality. what does this mean? That means in love of Maya, this illusion. What happens then? The bhukh - hunger of tisnaa - of greed na utraiis never quenched. an-din jalat firann - day and night they wonder around, jalat- burning in their own desires, brning in their own greed, burning in their own attachments. And what do those people do? They dostee make friendships with dustaa - with enemies, with evil ones, both internally and externally. Internally they make friendships with kaam, kroDh, loBh, Moh, Ahankaar; externally they make friendships with those people who indulge in evil acts. naal santaa vair karann with the saints, with the blessed ones they havevair- they have enmity. They are enemies of the saints. What happens to those people? They themselvesdubay - drown, basically this means that they themselves drown into world ocean. kutamb si-o - along with family, their friends, people they are around them, saglay kul dobann, those people end up dobann - bringing down their whole family, all those people around them with them. Guru Ji saysnindee-aa - of anyone, not one person, not two persons, Guru JI says kisai kee - it is not good to slander anyone. Guru Ji could have said not to slander good people but Guru Ji says it is not good to slander any people, good or bad, anyone. manmukh mugaDh karann, only people who are ignorant or foolish, who follow their mind. who are manmukh, indulge in that slander. And then what happens? Those people ,nindak, their faces are blackened; muh means face, kaalay means to be blackened; narkay ghor pavann, and they fall into the deepest ghor, narak, into the deepest hell. Whilst they are alive as well, because they are burning all the time with the nindee-aa they do of others. O my mind, Guru Amar Daas JI says jaisaa sayveh the one who you serve, taisaa hoveh, you will become like that one. If you serve Waheguru who isnirbhau, you will become nirbhau. If you serve Waheguru who is nirvair, you will becomenirvair. tayhay karam kamaa-ay Live your life and do your karam, do your actions according to this. O my mind you will have to sow the seed yourself, beej; aapay hee khaavnaa reap and eat what you have sowed. khaavnaa kahnaa kichhoo na jaa-ay Nothing else can be said about this matter Guru Amar Daas Ji says. This is the reality. Guru Ji says the peoplemahaa purkhaa who are blessed, spiritual beings, theirbolnaa, their words help us always. Always help us in everything we do. They are filledbharay, with amrit, immortal nectar all the time; bharpoor heh they are overflowing, onaa til na tamaa-ay those saints, sants, those mahapurakh have no greed, anything. Those people who have virtue they gather more virtue, gun sanghrai avraa updaysayn, they avraa means to others and updaysayn means to teach; they teach others to path of virtues. Those people arevadbhaagee, very fortunate, je onaa mil rahay, if they meet with those people, an-din naam la-ayn what will happen? By meeting all those people, day and night, you will also chant the Naam. Thatdataar- giver is one alone, sachaa true, and he himself is dhanee - master of all, wealthiest of all,sachaa aap Dhanee. That Waheguru , that Lord, that Satnaam is there with you at all times, gurmukh nadar nihaal but only the Gurmukhs, the ones who follow The Guru are blessed withnadar, with the glance by his grace and they become nihaal, they become exulted, they become ecstatic. 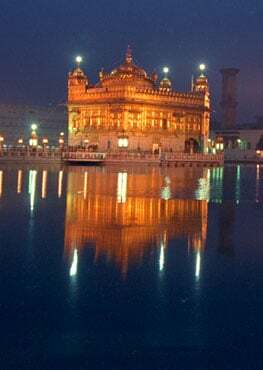 Only when Waheguru himselfbakhsay forgives you and mayl la-ay, and merges you into his being, those people sadaa samaal, all the time they contemplate Waheguru. prabh maelae - only if Prabhoo, only if Waheguru merges with us, then mil rehai - then we will always remain merged into Waheguru. Houmai sabadh jalaae, Guru Jee is saying though the sabadh, through The Guru’s word, your ego can be burnt. Through meditating upon the sabadh, your ego will be burnt and it will not remain. If we forget That sachaa, That truesahu – Husband Lord, dhhrig jeevan sa(n)saar; our life on this earth, our jeevan - life isdhhrig – cursed. Nadhar karae naa veesarai, O Waheguru Jee! Bless me with Your mercy, with Your nadhar. Naa veesarai – may I never forget You. Guramathee veechaar, through The Guru’smath, The Guru’s wisdom, I contemplate You, I do veechaar of You. If The true Guru unites us to Waheguru, we will always be united forever. Saach rakhaa our dhhaar. That person who is united by The true Guru always keeps saach, The True Lord within his or her heart, ur means heart. Guru Jee says miliaa hoe n veeshhurrai, once you’ve been united, you cannot be separated again. Gur kai heath piaar, All this happens through the heath piaar, through the love and affection for The Guru. Guru Jee says saalaahee – praise yourpir – Husband Lord. Praise aapanaa - your Husband Lord. How? By gur kai sabadh veechaar, By contemplating, by doing veechaar of The Guru’s sabadh, The Guru’s words. That person who follows that path mil preetham, is united with The beloved. Then what happens? Sukh paaeiaa – that person is blessed with joy. Sobhaava(n)thee naar, that soul bride is honored in this world and the next. The manamukh, the one who follows the mind, his or her man – mind is not bhijee – is not affected by this. Why? Because his or her mind is ath mailae – completely impure, completely full of sin. Chith kat(h)or – their consciousness if kat(h)or – is stonehearted. Guru Jee says even if you were to pee-aa-ee-ai – to feed dhudhh – milk to sapai – snake, a(n)dhar vis nikor. You will not be able to eradicate the vis, the poison a(n)dhar, inside. Aap karae - Waheguru Jee does everything himself. Kis aakheeai – who else can we ask? Who else can we say anything to? Aapae bakhasanehaar – Waheguru Himself is The One Who can forgive our sins. Through The Guru’s sabadh, through The Guru’s word mail outharai, our impurities can be removed and washed away. Then what happens? Thaa sach baniaa seegaar. Then we are blessed with the decoration of truth. Sachaa saahu – Waheguru is The true banker. Sachae vanajaarae – all the traders, all His beautiful saints who trade with Him are true as well. Outhhai koorrae n ttika(n)n, In that place, in Waheguru Jee’s court, koorrae n ttika(n)n, the false ones cannot even ttika(n)n, cannot even be there. Why? Because they do not bhaavee, they do not have love for the sach, for the truth. Dhukh hee maahi pacha(n)n. They are pacha(n)n, they are consumed by their own dhukh, by their own pain. The whole jag, the whole world is mailaa, is covered in the filth of what? Houmai – ego. Mar ja(n)mai vaaro vaar. Again and again, it dies and it’s born, it dies and it’s born, though ego. This is all happening through past actions, through karam of our past actions.Koe n maettanehaar – no one can erase these apart from Waheguru, The Guru. Those people who are blessed with the sa(n)gath, with the society, with the company of saints, what happens to them? They have piaar, they have love for the truth. sach salaahee – they praise The True Waheguru. Sach man – in their mind they have sach, they have the truth. Dhar sachai sachiaar. At the true court of The Lord, they are honoured as sachai sachiaar – as true ones. Guru Jee says that The perfect Guru has the perfect wisdom, math. Ahinis naam dhhiaae. What is that math? That math says ahinis naam dhhiaae – day in and day out meditate upon The Naam. houmai and maeraa, this ego is vadd rog, is the most terrible disease. Vichahu t(h)aak rehaae. Only when we get rid of these can we find t(h)aak – stillness inside. Guru Amar Das Jee says I praise my Guru again and again. Niv niv laagaa paae – I bow again and again to His ambrosial feet. I would soupee, I would offer my than- my body, my man – my mind, aagai dhharee – I lay it before Him.Vichahu aap gavaae. In this way, if you give your mind, body and soul to Waheguru, you will lose yourself from within. You will lose your ego, you will lose everything within. When you’re pulled in two directions, towards the illusion and towards the truth, towards the illusion, towards the truth, towards positive and good; then you will undecided, vigucheeai. However, Guru Jee is saying instead of doing that, instead of ruining your life that way, eaekas sio liv laae, focus your love towards eaekas, towards That One, That oneness, That Oankaar. Houmai maeraa shhadd thoo - Give up that ego. Thaa sach rehai samaae – only then can you remain merged into The truth. Those people who meet The Guru are bhaaeiraa, they are my brothers, they are my sisters. Sachae sabadh laga(n)n, because they attach themselves to the true sabadh, The word of The Guru. Sach milae sae n vishhurrehi - Those people who merge into the truth once can never be separated again. Dhar sachai dhisa(n)n – at The Guru’s court, they are seen as the true ones. Vikan means to sell, palharan means like straw. Like straw, they are selling, basically throwing away all their sins. Selling like straw means to throw away all their avagan, their sins. Instead, they have saajh, they have unity, they’re unified through what? Through gun, through virtue. Through the partnership of virtue, through the company of virtue, sukh oopajai – peace and happiness can oopajai, can flourish within us.Sachee bhagath karaen, only then can sachee bhagath, can true devotion be born inside us. Those gurmukhs, they sach vana(n)jehi, theyonly deal in the truth, gur shabadh sio – through The Guru’s sabadh. Laahaa naam leaen – they take the profit, the laahaa of The Naam. Sueinaa means gold, rupaa means silver. Gold and silver may be sa(n)cheeai, may be gathered together by paap, by committing sins; but chalai n chaladhiaa naal, it does not go with you when you die. When you leave this earth, you leave the gold. When you leave this earth, you leave the silver. When you leave this earth, you leave the car, you leave the family, you leave the house, you leave everything that you have earned. Apart from what? The Naam. If you’ve earned the profit of The Naam, that will not leave you. Without the naavai, without The Naam, nothing else can go with you. Sabh mut(h)ee jamakaal, everything else is in the mut(h)ee, is in the hand, is within the grasp of death besides The Naam. Naam rehiou saadhhoo rehiou rehiou gur gobi(n)dh || Guru Teg Bahardur Sahib says, The Naam remains, the saints remain; rehiou gur gobi(n)dh, The Guru and Waheguru will remain. Kahu naanak eih jagath mai kin japiou gur ma(n)th || Only those people who have meditated upon The Guru’s words, The Guru;s mantra, they will remain. Nothing else, everything else is within the grasp of death. The nourishment of the mind, the thosaa of the mind is the hari naam, The Name of Hari, The Name of Waheguru. so what should you do? Hiradhai rakhahu samhaal. Keep this Naam in your hiradhai, in your heart, samhaal – carefully. His wealth, this kharach is akhutt, is never-ending. Guramukh nibehai naal – it will remain with the Guramukhs. O my mind, if you forget your root Waheguru; jaasehi path gavaae – you will leave this world without any honour, without anypath. This whole world is attached in the false attachment, in thatdhoojai, that attachment to the illusion. Only throughguramathee, only through The guru’s wisdom sach dhhiaae – can you meditate upon the truth, can you realize the truth. There is no keemath, there is no value of Waheguru. Waheguru is beyond any value we can put upon them. Har jas likhan n jaae – Waheguru Jee’s praises cannot even be written, cannot be spoken, they are so infinite. Through The Guru’s shabad, when our mind and body is completely colored in The Guru’s shabad, completely devoted to The Guru’s shabad; thenhar sio rehai samaae – then we will merge into Hari, into Waheguru. That Waheguru of mine is ra(n)gulaa, is playful, is joyful; ra(n)gae sehaj subhaae – he colours us in His sehaj subhaae – in his natural intuitive balance. The soul bride can only be colored in this color, in thisra(n)g; jaa pir kai a(n)k samaae – when that soul bride merges into thea(n)k, into the being of The Husband Lord. Even those who have been vishhu(n)nae, who have been separated for chiree, for a long time; even they can be united. What must they do? Sathigur saeva(n)n – they do seva of The true Guru, of Sathiguru. Within all of us, the treasure, the nav nidhh, the nine treasures of The Naam is in everyone. Khaan kharachan n nikhuttee, it doesn’t matter how much you kharach it, doesn’t matter how much you spend it, n nikhuttee, it never ends. har gun sehaj rava(n)n – if you praise Hari, if you meditate upon His Naam, you will rava(n)n, you will be blessed with the state of sehaj, of intuitive balance. Then what happens? N aa oue janamehi - those beings are not born again. Naa marehi – they do not die again. Naa oue dhukh seha(n)n – they do not have to seha(n)n, suffer pain. Only those that The Guru saves, raakhae, sae oubarae – they are liberated. Har sio kael kara(n)n – forever and ever they play the beautiful games with Hari, with their Waheguru. Those friends who have united with Waheguru can never be separated again; je anadhin milae reha(n)n – if day and night they reha(n)n, remain united with Waheguru. In this world, there are only viralae, there are only very very few; Naanak sach leha(n)n, O Naanak, wholeha(n), who contain sach, The Satnaam. So Guru Jee is saying to us, give up falsehood, focus on the truth. Realize, this world will pass away, but The Guru will never pass away. Waheguru will never pass away.